Chinese tech giant Tencent has begun testing its own cloud gaming platform and is letting a select group of users sign up, as its rivals race to get ahead in the next big trend in the $135 billion video game market. Cloud gaming allows users to stream games rather than having to download them on smartphones or consoles, or buy physical copies. Instead, the game is run in the cloud. While the gaming industry has typically made money by selling consoles and games, in recent years, it has been shifting to more of a services model — where add-ons and in-game purchases have been on the rise. This has allowed console-makers to stretch out the lifetime of a console. Cloud gaming — sometimes referred to as gaming on demand — completely changes the way the industry works. Tencent recently launched a website for a product called "Start" and is allowing people in Shanghai and the southern China province of Guangdong to sign up for the test. The description on the website, written in Mandarin, translates as "you can play on any device." One of the benefits of cloud gaming is that it doesn't require specific hardware such as a games console. Start has not been launched yet and Tencent stressed it's in the early stages. "Cloud gaming is an emerging trend, and given our technical capabilities and rich portfolio of games, we are doing some internal research to evaluate the possibilities," a spokesperson for the company told CNBC by email. Tencent declined to provide further details about the product. In March, industry analyst Daniel Ahmad tweeted that Tencent would launch a cloud gaming service called "Tencent Instant Play." Daniel Ahmad tweet: Tencent and Intel are partnering on a new cloud gaming service called 'Tencent Instant Play'. The service will work on PC and Smartphones. 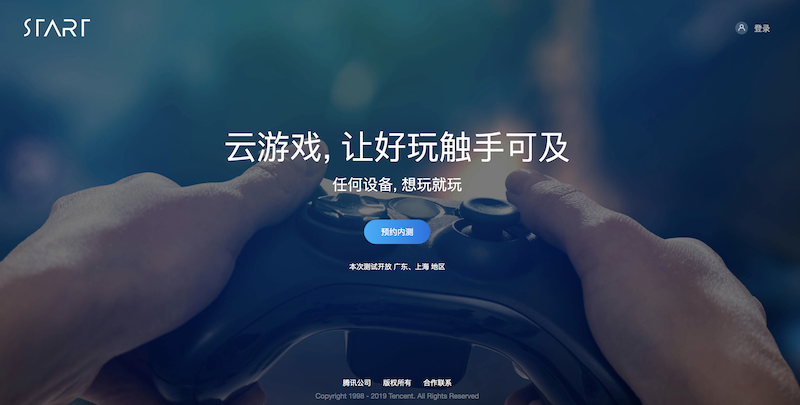 Tencent Instant Play is a partnership between the Chinese gaming giant and Intel, which tweeted days later to confirm the existence of the new cloud service which lets you play games "anywhere, anytime, on nearly any device." At an industry event called the Game Developers Conference in San Francisco last month, Tencent appeared to have some demonstrations of Instant Play, according to Chinese industry website Game Look. However, it's unclear whether Start is the rebranded version of Instant Play or whether they are two separate products. Tencent declined to comment when contacted by CNBC. Intel pointed to an earlier comment made by Kim Pallister, the company's chief technology officer of gaming, VR and e-sports. "While we can't comment on Tencent's work in the space, we're excited to collaborate with them," Pallister told trade magazine Variety in February. "At Intel, we're focused on leading and innovating in both server and client platform computing solutions. We are enthused about the development of cloud gaming offerings that companies are bringing to market." "We believe the increased flexibility and innovation in this space will allow the gaming market to grow and reach new gamers, offer games in new ways, and enable entirely new types of gaming over time," he said. While Tencent has remained tight-lipped about its future, it appears that cloud gaming is on the horizon for the Chinese firm. Global consumer spending on cloud gaming content subscriptions reached $234 million in 2018 and is forecast to grow to $1.5 billion by 2023, according to a forecast from IHS Markit. And major technology companies have thrown their hat in the ring.Google recently launched a product called Stadia which runs on the cloud and allows people to stream games. Microsoft is planning to test its own streaming service called Project xCloud this year, while Sony already sells a subscription service called PlayStation Now. Tencent has a number of advantages. It's the biggest games company in China, has its own cloud infrastructure and has the rights to license some of the country's biggest gaming titles. "Tencent cannot afford to sit on the sidelines while all big tech companies in the world invest in cloud gaming," Serkan Toto, CEO of Tokyo-based game industry consultancy Kantan Games, told CNBC. "Tencent has the big advantage that it has access to China, the world's biggest gaming market." He added that another advantage for Tencent is that "in contrast to Amazon or Google, for example, the company is a game developer itself and will be able to create content exclusively available through their future cloud service via its studios, which have a track record of releasing mega hits." However, Toto said Tencent may not find much success internationally, where other game firms have a bigger presence. "I currently cannot picture any scenario where Tencent could be successful on a global level. I think in the West, Western or Japanese cloud gaming providers will dominate in the end," Toto said.